Gov. Pawlenty says he's meeting with groups across the state to discuss the impact of undocumented immigrants on the state of Minnesota. Pawlenty says illegal immigration is a serious national problem and needs immediate attention. He says he plans on releasing several proposals over the next few months to toughen the state's immigration laws. Critics say Pawlenty is using the issue of immigration as a political wedge to help him get reelected next year. St. Paul, Minn. — Gov. Pawlenty has been talking a lot about undocumented immigrants over the past two weeks. His administration released a report last week that said illegal immigrants cost state taxpayers $180 million a year. Earlier this week, Pawlenty also met with the Minnesota Police Chiefs Association to talk about the public safety concerns undocumented workers raise. Pawlenty told the group that the U.S. is mostly a nation of immigrants, but said the system that allows them into the country has to be orderly and "law-abiding." "The current system, and the effects of the current system, that we now see playing out across the country and Minnesota doesn't meet that definition in my book, so we're looking for ways to try to do the state's role in making that system better," Pawlenty said. 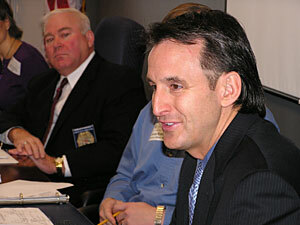 Reporters weren't allowed to attend Pawlenty's full meeting with the police chiefs. A spokesman said they closed the meeting so the chiefs could talk frankly with the governor about the issue. We do feel that he's declared war, because we do feel he has chosen us as ... kind of a scapegoat for political gain. After the meeting, Pawlenty said illegal immigration borders on being out of control and chaotic around the country. He says it's important to address the issue. "To say that this is not a legitimate issue before the country is ridiculous. Illegal immigration in the United States is a major issue," said Pawlenty. "And to simply discount it or ignore it as political is seemingly oblivious to the reality that's around us." Pawlenty said he's talking about the issue because he wants to make the immigration system better. He offered few specifics about what's wrong. But he said he wanted to address problems such as the false documents that illegal immigrants may use, illegal human trafficking and some other public safety issues. Pawlenty also blasted laws in some cities forbidding police officers from questioning people about their immigration status. The governor branded such ordinances "stupid." Pawlenty said he's been talking about immigration since his 2002 run for governor, and disputed the notion that he was using the issue for political gain. But others say his recent actions are pure politics. "We do feel that he's declared war, because we do feel he has chosen us as a topic that's kind of a scapegoat here for political gain," says Alberto Monserrate, president of the Latino Communications Network, which owns the Spanish language newspaper Gente de Minnesota. He's also a faithful member of Pawlenty's party. Monserrate says he's voted for Republicans repeatedly over the last several years, and served as a Republican delegate in past party conventions. Monserrate says he isn't happy the governor and other Republicans are using illegal immigration to attract votes. "The only explanation that I can find is that it is because of political reasons. He's having some tough numbers, nationally the party is having some tough numbers too," Monserrate said. "And all of sudden it's just coincidence that everybody is talking about illegal immigrants. Apparently it is doing very well in the surveys." Monserrate is also concerned that Pawlenty and others are only talking about the costs of undocumented workers. He says many illegal immigrants work in tough, low-paying jobs that U.S. citizens don't want to do. University of Minnesota public affairs professor Katherine Fennelly says she wants to see Pawlenty focus on both the costs and benefits of undocumented workers. She says the administration's finding that illegal immigrants cost state taxpayers $180 million a year doesn't paint the full picture. Fennelly studies immigration issues, and says the report didn't discuss any of the benefits that undocumented workers provide to the state. She also questions the sources the Pawlenty administration used. "I don't want to attribute motives, because I don't really don't know what the motives were by the governor or the Department of Administration. What I can talk about is whether they're using reliable sources and drawing conclusions that have merit, and I would say that the answer to those two questions is no," says Fennelly. For his part, Pawlenty says undocumented immigrants do provide great benefits to Minnesota. He has met with representatives of immigrant groups to discuss the issue. One of those who attended the group wouldn't comment on what was discussed. What happened to Mike Hatch?